This project will restore ecosystem services through the reintroduction of riparian habitat on the Calivil Creek. It will increase the extent of Riverine Chenopod Woodland (listed as vulnerable in Victoria) and improve the connectivity along the riparian zone of the creek. Works include fencing out stock and revegetation with Black Box (Eucalyptus largiflorens) and indigenous understory flora. The project will address a lack of connectivity in the landscape, linking remnant black box areas along the creek, and providing a new stepping stone between existing remnants patches nearby. The riparian restoration will provide a link for birds and wildlife in the landscape that is currently not there. To date 6.75 km of fencing has been installed along 4 km of the creek. The fencing was erected through funds from a DEPI Kerang Biodiversity Fund project. 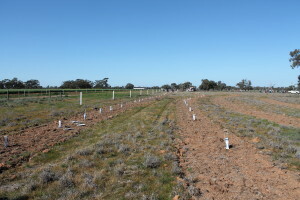 In 2015 the Network secured a 20 Million Trees Grant as part of the Australian Government’s National Landcare Programme to revegetate a 5.33km portion of the creek with 3560 tubestock and 16km of direct seeding. 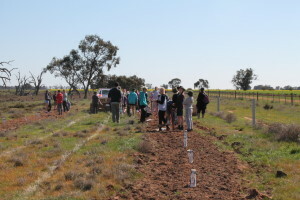 Planting was undertaken in September 2015 with 80 East Loddon P-12 College students, members of the Loddon Vale Landcare Group and the Green Army Team from the Landscape Change in Upper Loddon Catchment Project. 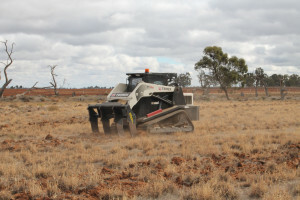 The Loddon Vale Landcare Group is a key partner with the Network on the project. Photos: The Calivil Creek ground preparation and planting underway.